Figure 1 shows the conduction system of the heart. The SA node is labelled 1. The sinoatrial node (SA node), also known as sinus node, is a group of cells located in the wall of the right atrium of the heart. These cells have the ability to spontaneously produce an electrical impulse (action potential; see below for more details), that travels through the heart via the electrical conduction system (see figure 1) causing it to contract. In a healthy heart, the SA node continuously produces action potential, setting the rhythm of the heart and so is known as the heart's natural pacemaker. The rate of action potential production (and therefore the heart rate) is influenced by nerves that supply it. The sinoatrial node is a banana-shaped structure that varies in size, usually between 10-30 millimeters (mm) long, 5–7 mm wide, and 1–2 mm deep. 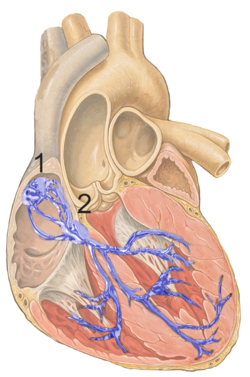 The SA node is located in the wall (myocardium) of the right atrium, laterally to the entrance of the superior vena cava in a region called the sinus venarum (hence sino- + atrial). It is positioned roughly between a groove called the crista terminalis located on the internal surface of the heart and the corresponding sulcus terminalis, on the external surface. These grooves run between the entrance of the superior vena cava and the inferior vena cava. Figure 2: Low magnification stained image of the SA node (center-right on image) and its surrounding tissue. The SA node surrounds the sinoatrial nodal artery, seen as the open lumen. Cardiac muscle cells of the right atrium can be seen to the left of the node, and fat tissue to the right. The cells of the SA node are spread out within a mesh of connective tissue, containing nerves, blood vessels, collagen and fat. Immediately surrounding the SA node cells are paranodal cells. These cells have structures intermediate between that of the SA node cells and the rest of the atrium. The connective tissue, along with the paranodal cells, insulate the SA node from the rest of the atrium, preventing the electrical activity of the atrial cells from affecting the SA node cells. The SA node cells are smaller and paler than the surrounding atrial cells, with the average cell being around 8 micrometers in diameter and 20-30 micrometers in length (1 micrometer= 0.000001 meter). Unlike the atrial cells, SA node cells contain fewer mitochondria (the power plant of the cell), fewer myofibers (the contractile machinery of the cell), and a smaller sarcoplasmic reticulum (a calcium storage organelle that releases calcium for contraction). This means that the SA node cells are less equipped to contract compared to the atrial and ventricular cells. Action potentials pass from one cardiac cell to the next through pores known as gap junctions. These gap junctions are made of proteins called connexins. There are fewer gap junctions within the SA node and they are smaller in size. This is again important in insulating the SA node from the surrounding atrial cells. There are no large veins that drain blood away from the SA node. Instead, smaller venules drain the blood directly into the right atrium. The main role of a sinoatrial node cell is to initiate action potentials of the heart, so that it can pass throughout the heart and cause contraction. An action potential is a change in voltage (membrane potential) across the membrane of the cell, produced by the movement of charged atoms (ions). Non-pacemaker cells (including the ventricular and atrial cells) have a period, immediately after an action potential, where the membrane potential remains relatively constant; this is known as a resting membrane potential. This resting phase (see cardiac action potential, phase 4) ends when another action potential reaches the cell. This produces a positive change in membrane potential (known as depolarisation), which initiates the start of the next action potential. Pacemaker cells, however, don’t have this resting phase. Instead, immediately after one action potential, the membrane potential of these cells begins to depolarise again automatically, this is known as the pacemaker potential. Once the pacemaker potential reaches a set value, known as the threshold value, it then produces an action potential. Other cells within the heart (including the purkinje fibers and atrioventricular node; AVN) can also initiate action potentials; however, they do so at a slower rate and therefore, if the SA node is working, it usually beats the AVN to it. Outlined below are the 3 phases of a sinoatrial node action potential. In the ventricular action potential, there are 5 phases (labelled 0-4), however pacemaker action potentials don’t have an obvious phase 1 or 2. Figure 3: Sinoatrial node action potential waveform, outlining major ion currents involved (downward deflection indicates ions moving into the cell, upwards deflection indicates ions flowing out of the cell). This phase is also known as the pacemaker potential. Immediately following an action potential, when the membrane potential is very negative (it is hyperpolarised) the voltage slowly begins to increase. This is initially due to the closing of potassium channels, which reduces the flow of potassium ions (Ik) out of the cell (see phase 3, below). Alongside the deactivation of the potassium channels, channels known as hyperpolarisation-activated cyclic nucleotide–gated (HCN) channels, are activated. Activation of these channels at very negative membrane potential is an unusual property for ion channels, therefore the flow of sodium (Na+) and some potassium (K+) through the activated HCN channel is referred to as a funny current (If). This funny current causes the membrane potential of the cell to gradually increase, as the positive charge (Na+ and K+) is flowing into the cell. Another mechanism involved in pacemaker potential is known as the calcium clock. Here, calcium is released spontaneously from the sarcoplasmic reticulum (a calcium store) into the cell, this is known as a spontaneous Ca2+ spark. This increase in calcium within the cell then activates a sodium-calcium exchanger (NCX), which removes one Ca2+ from the cell, and exchanges it for 3 Na+ into the cell (therefore removing a charge of +2 from the cell, but allowing a charge of +3 to enter the cell) therefore in-creasing the membrane potential. The calcium is later pumped back into the cell via calcium channels located on the cell membrane and SR membrane. The increase in membrane potential produced by these mechanisms, activates T-type calcium channels and then L-type calcium channels (which open very slowly). These channels allow a flow of calcium ions (Ca2+) into the cell, making the membrane potential more positive. This is the depolarisation phase. When the membrane potential reaches a threshold value (around -20 to -50 mV), it begins to rapidly depolarise (become more positive). This is mainly due to the flow of Ca2+ through the L-type calcium channels, which are now fully open. During this stage the T-type calcium channels and HCN channels deactivate. This phase is the repolarisation phase. This occurs due to the inactivation of the L-type calcium channels (preventing the movement of Ca2+ into the cell), and the activation of potassium channels, which allows the flow of K+ out of the cell, making the membrane potential more negative. Heart rate depends on the rate at which the sinoatrial node produces action potentials. At rest, heart rate is between 60 and 100 beats per minute. This is a result of the activity of two sets of nerves, one acting to slow down action potential production (these are parasympathetic nerves) and the other acting to speed up action potential production (sympathetic nerves). The sympathetic nerves begin in the thoracic region of the spinal cord (in particular T1-T4). These nerves release a neurotransmitter called noradrenaline (NA). This binds to a receptor on the SA node membrane, called a beta-1adrenoceptor. Binding of NA to this receptor activates a G-protein (in particular a Gs-Protein, S for stimulatory) which initiates a series of reactions (known as the cAMP pathway) that results in the production of a molecule called cyclic adenosinemonophosphate (cAMP). This cAMP binds to the HCN channel (see above). Binding of cAMP to the HCN, increases the flow of Na+ and K+ into the cell, speeding up the pacemaker potential, so producing action potentials at a quicker rate, and increasing heart rate. An increase in heart rate is known as positive chronotropy. The parasympathetic nerves supplying the SA node (in particular the Vagus nerves) originate in the brain. These nerves release a neurotransmitter called acetylcholine (ACh). ACh binds to a receptor called an M2 muscarinic receptor, located on the SA node membrane. Activation of this M2 receptor, then activates a protein called a G-protein (in particular Gi protein, i for inhibitory). Activation of this G-protein, blocks the cAMP pathway, reducing its effects, therefore inhibiting sympathetic activity and slowing action potential production. As well as this, the G-protein also activates a potassium channel, which allows K+ to flow out of the cell, making the membrane potential more negative and slowing the pacemaker potential, therefore decreasing the rate of action potential production and therefore decreasing heart rate. A decrease in heart rate is known as negative chronotropy. The first cell to produce the action potential in the SA node isn’t always the same, this is known as pacemaker shift. In certain species of animals, for example, in dogs, a superior shift (i.e. the cell that produces the fastest action potential in the SA node is higher than previously) usually produced an increased heart rate whereas an inferior shift (i.e. the cell producing the fastest action potential within the SA node is further down than previously) produced a decreased heart rate. Sinus node dysfunction describes an irregular heartbeat caused by faulty electrical signals of the heart. When the heart's sinoatrial node is defective, the heart’s rhythms become abnormal – typically too slow or exhibiting pauses in its function or a combination, and very rarely faster than normal. Blockage of the arterial blood supply to the SA node (most commonly due to a myocardial infarction or progressive coronary artery disease) can therefore cause ischaemia and cell death in the SA node. This can disrupt the electrical pacemaker function of the SA node, and can result in sick sinus syndrome. If the SA node does not function, or the impulse generated in the SA node is blocked before it travels down the electrical conduction system, a group of cells further down the heart will become its pacemaker. The sinoatrial node was first discovered by a young medical student, Martin Flack, in the heart of a mole, whilst his mentor, Sir Arthur Keith, was on a bicycle ride with his wife. They made the discovery in a makeshift laboratory set up in a picturesque farmhouse in Kent, England, called Mann's Place. Their discovery was published in 1907. ^ . Keith A, Flack M. The form and nature of the muscular connections between the pri-mary divisions of the vertebrate heart. J Anat Physiol 1907; 41:172–189. ^ MONFREDI, O., DOBRZYNSKI, H., MONDAL, T., BOYETT, M.R. and MORRIS, G.M. (2010) ‘The anatomy and physiology of the Sinoatrial Node-A contemporary review’, Pacing and Clinical Electro-physiology, 33(11), pp. 1392–1406. doi: 10.1111/j.1540-8159.2010.02838.x. ^ Csepe, Thomas A.; Zhao, Jichao; Hansen, Brian J.; Li, Ning; Sul, Lidiya V.; Lim, Praise; Wang, Yufeng; Simonetti, Orlando P.; Kilic, Ahmet (1 March 2017). "Human Sinoatrial Node Structure: 3D Microanatomy of Sinoatrial Conduction Pathways". Progress in Biophysics and Molecular Biology. 120 (1–3): 164–178. doi:10.1016/j.pbiomolbio.2015.12.011. ISSN 0079-6107. PMC 4808362. PMID 26743207. ^ Chandler, N., Aslanidi, O., Buckley, D., Inada, S., Birchall, S., Atkinson, A., Kirk, D., Monfredi, O., Molenaar, P., Anderson, R., Sharma, V., Sigg, D., Zhang, H., Boyett, M. and Dobrzynski, H. (2011) ‘Computer three-dimensional anatomical recon-struction of the human sinus node and a novel paranodal area’, Anatomical record (Hoboken, N.J. : 2007)., 294(6), pp. 970–9. ^ MONFREDI, O., DOBRZYNSKI, H., MONDAL, T., BOY-ETT, M.R. and MORRIS, G.M. (2010) ‘The anatomy and physiology of the Sinoatrial Node-A con-temporary review’, Pacing and Clinical Electrophysiology, 33(11), pp. 1392–1406. doi: 10.1111/j.1540-8159.2010.02838.x. ^ MON-FREDI, O., DOBRZYNSKI, H., MONDAL, T., BOYETT, M.R. and MORRIS, G.M. (2010) ‘The anatomy and physiology of the Sinoatrial Node-A contemporary review’, Pacing and Clinical Electrophysiol-ogy, 33(11), pp. 1392–1406. doi: 10.1111/j.1540-8159.2010.02838.x. ^ 6. Chandler NJ, Greener ID, Tellez JO, Inada S, Musa H, Molenaar P, Difrancesco D, et al. Molecular architecture of the human sinus node: Insights into the function of the cardiac pacemaker. Circulation 2009; 119:1562–1575. ^ MONFREDI, O., DOBRZYNSKI, H., MONDAL, T., BOYETT, M.R. and MOR-RIS, G.M. (2010) ‘The anatomy and physiology of the Sinoatrial Node-A contemporary re-view’, Pacing and Clinical Electrophysiology, 33(11), pp. 1392–1406. doi: 10.1111/j.1540-8159.2010.02838.x. ^ Honjo, H., Boyett, M.R., Kodama, I. and Toyama, J. (1996) ‘Correlation between electrical activity and the size of rabbit sino-atrial node cells’, 496(Pt 3). ^ Boyett, Honjo, H. and Kodama, I. (2000) ‘The sinoatrial node, a heterogeneous pace-maker structure’, Cardiovascular research., 47(4), pp. 658–87. ^ Boyett, Honjo, H. and Kodama, I. (2000) ‘The sinoatrial node, a heterogeneous pacemaker structure’, Cardiovascular research., 47(4), pp. 658–87. ^ MONFREDI, O., DOBRZYNSKI, H., MONDAL, T., BOYETT, M.R. and MORRIS, G.M. (2010) ‘The anatomy and physiology of the Sinoatrial Node-A contemporary review’, Pacing and Clinical Electrophysiology, 33(11), pp. 1392–1406. doi: 10.1111/j.1540-8159.2010.02838.x. ^ Vikse, J., Henry, B.M., Roy, J., Ramakrishnan, P.K., Hsieh, W.C., Walocha, J.A. and Tomaszewski, K.A. (2016b) ‘Anatomical variations in the Sinoatrial Nodal artery: A Meta-Analysis and clinical con-siderations’, 11(2). ^ Anderson, K.R., Ho, S.Y. and Anderson, R.H. (1979) ‘Location and vascular supply of sinus node in human heart’, 41(1). ^ Tsien, R. W.; Carpenter, D. O. (1 June 1978). "Ionic mechanisms of pacemaker activity in cardiac Purkinje fibers". Federation Proceedings. 37 (8): 2127–2131. ISSN 0014-9446. PMID 350631. ^ Vassalle, M. (1977). "The relationship among cardiac pacemakers: Overdrive suppression". Circulation Research. 41 (3): 269–77. doi:10.1161/01.res.41.3.269. PMID 330018. 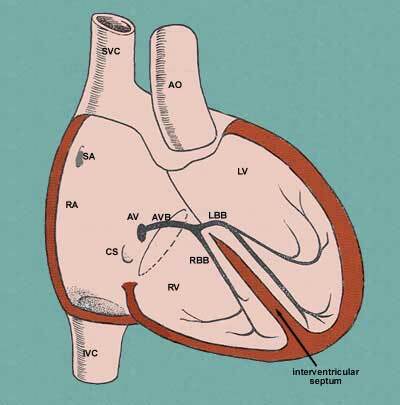 ^ Irisawa H, Brown HF, Giles W. Cardiac pacemaking in the sinoatrial node. Physiol Rev 1993; 73:197–227. ^ DiFrancesco, D. (2010) ‘The role of the funny current in pacemaker activity’, Circulation research., 106(3), pp. 434–46. ^ Verkerk, A., Borren, van, Peters, R., Broekhuis, E., Lam, K., Coronel, R., Bakker, de, Tan, H. and Wilders, R. (2007) ‘Single cells isolated from human sinoatrial node: Action potentials and numerical reconstruction of pacemaker current’, Conference proceedings : ... Annual International Conference of the IEEE Engineering in Medicine and Biology Society. IEEE Engineering in Medicine and Biology Society. Annual Conference., 2007, pp. 904–7. ^ Clark, R.B., Mangoni, M.E., Lueger, A., Couette, B., Nargeot, J. and Giles, W.R. (2004) ‘A rapidly activating delayed rectifier K+ current reg-ulates pacemaker activity in adult mouse sinoatrial node cells’, Article, 286(5), pp. 1757–1766. doi: 10.1152/ajpheart.00753.2003. ^ Gordan, R., Gwathmey, J.K. and Xie, L.-H. (2015) ‘Autonomic and endocrine control of cardiovascular func-tion’, 7(4). ^ Larsson, P.H. (2010) ‘How is the heart rate regulated in the sinoatrial node? Another piece to the puzzle’, 136(3). ^ Osterried-er W., Noma A., Trautwein W.(1980) On the kinetics of the potassium current activated by acetylcholine in the SA node of the rabbit heart. Pflügers Arch. 386:101–109. ^ MONFREDI, O., DOBRZYNSKI, H., MONDAL, T., BOYETT, M.R. and MORRIS, G.M. (2010) ‘The anatomy and physiology of the Sinoatrial Node-A con-temporary review’, Pacing and Clinical Electrophysiology, 33(11), pp. 1392–1406. doi: 10.1111/j.1540-8159.2010.02838.x. ^ Silverman, M.E. ; Hollman, A. (1 October 2007). "Discovery of the sinus node by Keith and Flack: on the centennial of their 1907 publication". Heart. 93 (10): 1184–1187. doi:10.1136/hrt.2006.105049. PMC 2000948. PMID 17890694. ^ Boyett MR, Dobrzynski H (June 2007). "The sinoatrial node is still setting the pace 100 years after its discovery". Circ. Res. 100 (11): 1543–5. doi:10.1161/CIRCRESAHA.107.101101. PMID 17556667. Anatomy figure: 20:06-01 at Human Anatomy Online, SUNY Downstate Medical Center - "The conduction system of the heart." This page was last edited on 21 February 2019, at 01:29 (UTC).